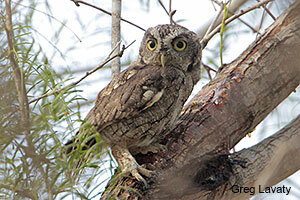 Eastern Screech-Owls are the most common owl in Houston. Very small (8" - 9"), they have two color morphs: gray and red, with gray being the most common. They are best seen in the early evening or pre-dawn hours. Their call is long, descending quavering whinny. A second call is a long, low trill. They are relatively tame and curious, and have been known to follow evening strollers out of curiosity. 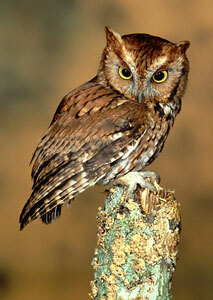 Eastern Screech-Owls are found in woodlands and wooded urban areas. They mainly eat insects, but also like to hunt for small fish and frogs. The are especially fond of yards with ponds. They nest in tree cavities, but since those are in such short supply, they also readily use manmade Screech-Owl houses.